This month’s album choice is courtesy of 27-year old American-Japanese musician Mitski Miyazaki, mononymously known as “Mitski”. I first encountered her when Pitchfork nominated Your Best American Girl as one of their best videos of 2016. True, the promo was clever and inspired, a visual metaphor for the alienation that a young Asian woman feels growing up in America and the insecurity of trying/failing to appeal to white boys. The song itself completely blew me away. It could have come directly from the halcyon days of early-nineties grunge, commencing with an almost inaudible whisper before that exhilarating moment when Mitski presses her effects pedal and the song explodes towards its angst-ridden cascading guitar-drenched finale. If only Kurt were alive to witness this two and a bit minutes of pop/rock perfection. Puberty 2 was fêted by critics and rightly ended up on many best of the year lists. It certainly helped raise Mitski’s profile, one of the burgeoning collective of female American singer-songwriters that includes Annie Clarke aka St. Vincent and Michelle Zauner aka Japanese Breakfast. The latter bears similarities to Mitski in that Zauner is an American with Korean parentage. Her excellent video for Everybody Wants To Love You is thematically similar to Best American Girl, Zauner attired in startling full traditional Korean dress as she parties around California. 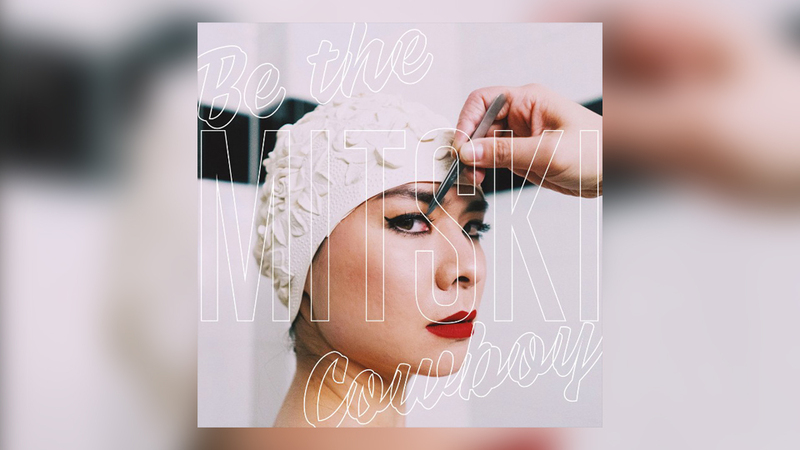 Mitski returns in 2018 with her fifth album Be The Cowboy, perhaps with expectations heightened after previous success and contemporaneous with St. Vincent’s rising profile. Be The Cowboy does not disappoint. Fourteen tracks, almost entirely clocking in at 150 seconds each, combine to create a cohesive, clever and affecting album. Mitski’s musical career began with piano, the instrument she studied at music college, before she adopted guitar for her last two releases. Be The Cowboy sees the piano return to take a more prominent role in arrangement, the final song eschewing the six-string altogether. Consequently, it has a slightly wider musical palette than her previous work, and is perhaps a little poppier too. A fine example is Nobody, whose jaunty chorus is dichotomous to the lyrical content of confusion and loneliness, where all she craves is “just one good movie kiss” to put her on an even keel. It’s a killer pop song, clever in the way the key keeps changing towards the end and wrong-foots the listener. Combined with the surreal video, straight from the pages of an existential Haruki Murakami novel, it is well worth clicking the link below. There is a conciseness to Be The Cowboy that I appreciate. There is no let up in quality control; songs never outstay their welcome. Mitski gets the points across with her confessional lyrics laced with mordant humor, her audience privy to her diary, before we are swiftly moved onto the next song. The musicianship sounds completely assured but never predictable. From the gradual build of droning opener Geyser to the stomping beat of Washing Machine Heart, this album keeps you on your toes. Listening from start to finish (remember when we did that before streaming? ), you find yourself rooting for Mitski who is just longing for romance, as she implores on several songs, just one meaningful kiss. Without that she resorts to fantasizing about being happily married, as in the tellingly titled Me and My Husband. She sings with such conviction, so blissfully unaware, that you want to tap her on the shoulder and tell her that it’s not real. The finest track, Two Slow Dancers, is actually the last. Here we can really appreciate her sonorous voice, that like so many artists, sounds much deeper and fuller than in conversation, a voice that attains pathos and melancholy when attached to melody. A piano is all Mitski needs as she delivers the devastatingly poignant lyrics of a couple in their twilight years, but very much in love as the world rushes ever-faster around them. One wonders how a twenty-something could have such insight and sing so meaningfully. No doubt you will see Be My Cowboy on the best of 2018 lists come December. An artist like Mitski is never going to trouble the charts. A bit like St. Vincent, she is a bit too outré for mainstream consumption, yet paradoxically is building a strong fan base that is measured by sell out tours rather than top ten singles. Five albums in and you feel that Mitski is only just beginning to realize her potential as a savvy, musically gifted, sophisticated artist that has two or three more classic albums up her sleeve. Your best American girl? Hey, that’s you Miyawaki San. Hmm...cowboys. America. Let’s go for an Oregon Pinot Noir, say the 2014 Clos Electrique Chardonnay from Cameron.